Chicka, a Bull Terrier, had some things going against her. First and foremost, she was deaf. The folks at Lake Animal Hospital/Shelter in Storm Lake, IA, who had taken her in when her family moved, had high hopes that someone would come along who would want her. Read Penny’s story in Katie’s words. Their hopes were realized when they heard from Katie Westmorland of Milan, IL. 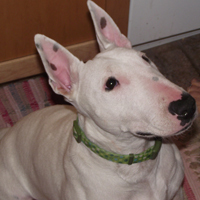 She and her family had lost their Bull Terrier to kidney disease, and they were missing him. She began looking on Petfinder for Bull Terriers. “As soon as I saw her face, I fell in love,” says Katie. The family had other dogs and cats, so Katie contacted the shelter and asked if Chicka tolerated other animals. Dogs were fine, but the staff wasn’t so sure about cats. They tested Chicka, and she passed. So far so good. Then the staff explained that the dog was deaf and showed some food aggression. Would those be deal breakers to the Westmorlands? The family talked it over and decided to adopt. They renamed their new family member Penny. Katie’s husband walks their dogs several miles a day, and Penny is the best of the pack because she isn’t distracted by barking dogs and traffic noise and is super-attentive to her people.